Former Ravens linebacker O.J. Brigance, who is credited with the first tackle in Super Bowl XXXV, which his Baltimore Ravens went on to win 34-7. Brigance has been battling ALS – also known as Lou Gehrig’s Disease – for eight years. A 2001 Super Bowl champion, Brigance is now confined to a wheelchair. He urged lawmakers to reject Maryland’s Death With Dignity Act, introduced by Sen. Ron Young and Del. Shane Pendergrass, both Democrats. The bill would allow people to end their lives if they are given a terminal diagnosis. Critics testifying before the state’s lawmakers said a physician-assisted suicide bill would prey on those who are vulnerable or disabled. Brigance was diagnosed with amyotrophic lateral sclerosis in 2007. Although living with the disorder required major lifestyle adjustments, he now embraces life fully and even leads an organization called the “Brigance Brigade,” which offers grants to families living with the disease. The organization has provided, among other benefits, assistance ramps, wheelchairs and communication devices to those in need. When the football player heard that a right-to-die bill, which would allow terminally ill patients to obtain a lethal dose of a drug from a doctor, was making its way through the Maryland legislature, he knew he had to try and block its path. 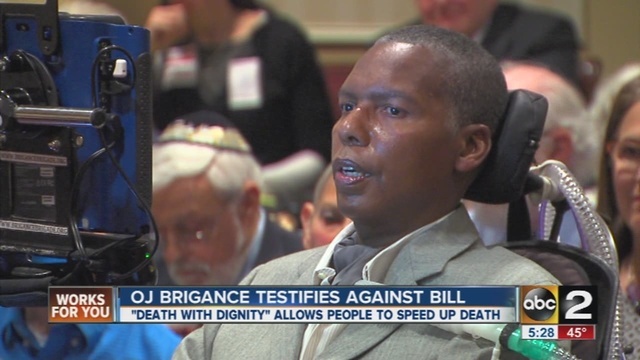 “…valuable contributions can still be made in life, despite one being diagnosed with a terminal illness,” said Brigance, whose public seven-year fight against ALS has made the former star and current Ravens front-office staffer both a national advocate for people with the neurodegenerative disease and an inspiration to the team. “I don’t think legislation should be approved to legally take a life before the appointed time,” he said. Maryland is one of around a dozen states considering right-to-die legislation this year. States considering similar measures include Alaska, California, Connecticut, Iowa, Kansas, Maryland, Massachusetts, Missouri, New Jersey, New York, Oklahoma, and Wisconsin. The District of Columbia is also debating a bill. Oregon, Vermont and Washington have legalized medically assisted suicide; courts in Montana and New Mexico have ruled in favor of it. Although his life is much different than it was a decade ago, Brigance argues it is one that is still worth preserving. Others living with disabilities agree with the football player.